Over 20 years ago, Apollo English opened the first entirely foreign-owned language center in Vietnam. With the country reaching its current economic tipping point, it’s easy to forget the difficulties foreign companies faced starting business here during the 1990s. In fact, Apollo English opened the same year Trung Nguyen launched their first coffee shop in Ho Chi Minh City—two openings that prefigured the rapid economic expansion of the 2000s. Behind Apollo are Khalid Muhmood and Arabella Peters. Khalid first visited Saigon in 1992 when cyclos and street vendors still ruled the city. He then spent two years teaching at Singapore International School before returning to Vietnam to explore the opportunities the education sector here offered. The period since Apollo’s opening to today has been a tumultuous one for education. Accountability, through internationally benchmarked tests like PISA and Timss, and measurability, through guidelines like the Common European Framework of Reference, have been two key trends. Also, technology offered the chance to provide on-demand learning, the internet enabled easy access to research, and mobile allowed for virtual on-the-go classrooms. Though technology created opportunities for brick-and-mortar schools like Apollo they also presented challenges around how to best harness innovation to empower learners. 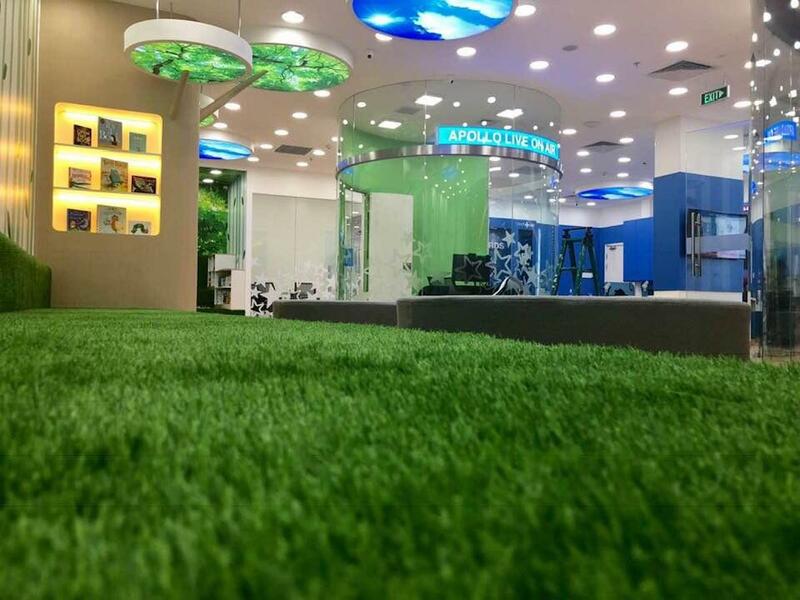 Today, Apollo has 39 centers in Vietnam. 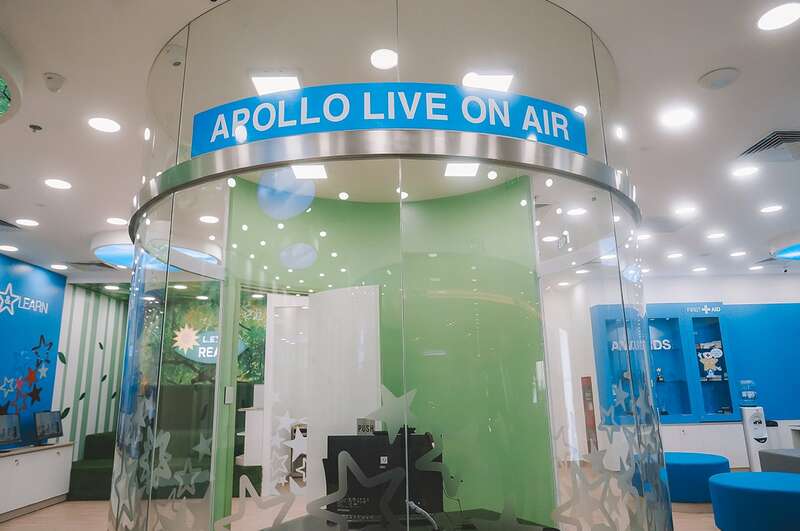 In Ho Chi Minh City, the newest, the Apollo Innovation Center in District 2’s Estella Place mall, offers students the opportunity for blended learning, allowing them to attend on-site classes and to continue their learning at home through one-on-one video sessions with a teacher. This educational structure is part of a new model of learning that Apollo hopes to franchise internationally in the near future. At such a pivotal time for Apollo, we wanted to check in with Khalid and Arabella to learn how they have spent the last twenty years helping Vietnamese learners become global citizens. 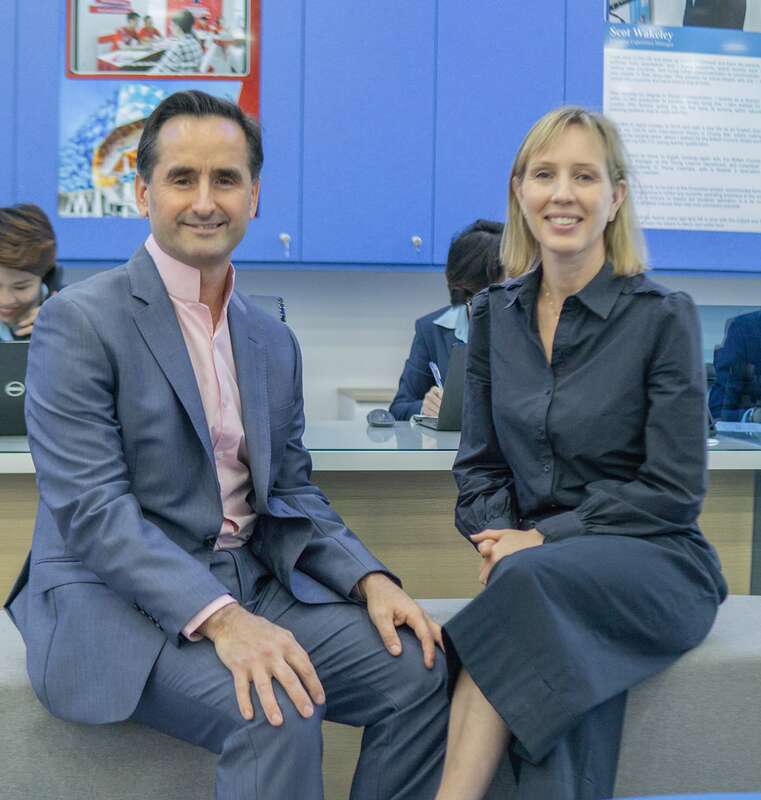 Arabella Peters (left) and Khalid Muhmood (right), founders of Apollo English. Can you introduce yourselves and tell us what you do (and why you do it)? Arabella: Khalid and I co-founded the Apollo English company in 1995. Since then we have helped thousands of learners develop confidence and fluency in using English, which has taken them on new paths in life whether at school, or at university overseas, or in their careers. We’ve also since gone on to found the British University Vietnam. As young people, we both benefited from many life-changing learning opportunities and when we developed the idea to found our own company one of the key drivers was to be able to offer life-changing learning opportunities to other people around the world. If you could go back in time and change your childhood school curriculum, what would you change about it to better prepare you for your career? Khalid: There was too much emphasis on academic outcomes and not enough on other skills. Today there is more focus on skills such as resilience, self-awareness, confidence, collaboration, curiosity, and critical thinking. These are skills that I feel end up being much more useful in life. Success is more than academic results. Arabella: Put theory into practice and learn by doing. I believe that we can only really deeply understand something by doing it ourselves. Why is education perceived to lag behind other industries—the healthcare industry is an oft-cited example—-in its successful employment of technology? Khalid: The main barriers for the adoption of technology in the education industry usually come from parents, school heads and teachers. Students are usually very open to change. On the positive side, I’m impressed by how much technology many children do use in schools today so change is definitely in the air. Additionally, lots of technology-in-schools programs have failed to show improved outcomes. How has Apollo approached the successful integration of technology? And how has Apollo’s relationship to technology changed since your founding? Arabella: We are very open to new ideas in technology but we always focus on the measurable impact it can have on learners’ results. Where organizations do go wrong is by employing technology that sounds and looks good but that doesn’t actually influence learner outcomes. As an organization, we have learnt over the years to refine our ability to implement change which is always a challenge in any fast growing organization. Also, having our head office in Singapore and a strong presence in the UK enables us to keep a broad view on international trends in our sector. 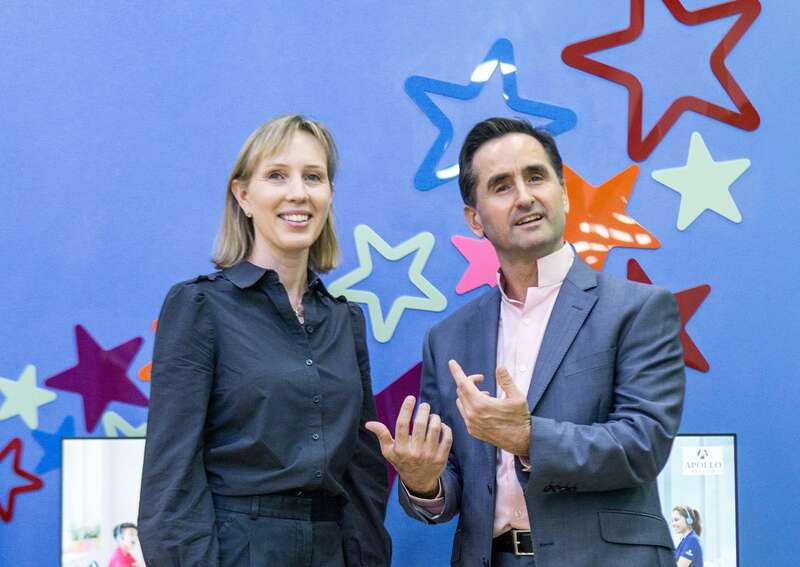 “We firmly believe there is a place for face-to-face and classroom learning in the future and it will be exciting to see how that can be delivered as technology progresses,” said Khalid. What is the future of English language learning? Khalid: Overall the future is exciting as the availability and accessibility of English language learning opportunities is only increasing, especially with innovations in technology. We firmly believe there is a place for face-to-face and classroom learning in the future and it will be exciting to see how that can be delivered as technology progresses. Educators change lives. How has the pool of teachers available to you changed since you opened the first foreign-owned English language training centre in 1998? Arabella: Vietnam is now a very popular destination. It’s considered a great place to teach so we have a substantial pool of teachers who apply to work with us, primarily from the USA, the UK, Australia, and New Zealand. Khalid: Delivering learning outcomes is in our DNA and to make sure we achieve that not only do we recruit the right profile of teachers, in terms of qualifications and attitude, but we also engage in extensive training. Every team of teachers has a dedicated Learning Experience Manager who is usually one of our teaching team that has progressed to a management role. They’re the ones overseeing the quality of our classroom experience. Our lessons are systemized and we work closely with our learning content partners, including National Geographic, to continuously improve our programs. Which skills do you think are most valuable to young Vietnamese learners, and how are you equipping them with those skills? Khalid: Our mission is to develop global citizens. We believe it’s critical for young people to have an awareness of the wider world and to understand their place in it. Our English Language program is designed to engage learners in developing their understanding of the world and we ensure that learners develop their language skills through a process of enquiry. We encourage them to take risks in their learning in an environment where they know the only outcome will be increased knowledge. This develops a strong sense of confidence and self-awareness and encourages them to be open to collaboration, and to be creative. Which educators’ ideas do you follow, and which books or even physical schools, or education projects outside of Apollo have made the biggest impression on you and why? Arabella: To generate ideas we prefer to get out to education exhibitions, seminars, schools, incubators and the research labs to see what is happening and then build our own view from that. Meeting with parents, students, and our front line team is also very important. We were recently in London at one of the world’s largest education exhibitions and also spent time with artificial intelligence experts. We invest a lot of time and money in keeping in touch with what’s happening globally and then developing our own way of integrating those ideas to benefit our learners. “We have a clear focus—to educate people to become global citizens and foster prosperity,” Khalid explains. In an increasingly crowded industry, what is Apollo doing that no-one else is? Khalid: One of the key differentiators about our organization is that the founders are still the owners. That’s quite rare today. We also have a clear focus—to educate people to become global citizens and foster prosperity. We also take a long-term view and continuously invest in the highest quality outcomes for our learners. Arabella: Our aspiration at Apollo is that we are the place where the best become better and this applies to our learners and our team. Our team is driven by very strong values and the integrity and passion with which they deliver the best learning outcomes for our students. Our expertise also enables us to embrace technology in the most appropriate way and to combine the classroom learning experience with personalized learning outside the classroom. The Apollo broadcasting booth. Inside a teacher goes through the online learning process as guests watch. If the Arabella and Khalid from 1995, when Apollo English was first formed, met you both today what would you talk about? Arabella: I’m sure we would talk about the incredible journey that we’ve been on and the challenges and the opportunities that we’ve encountered. I think we’d also have a good laugh too about how, when we first started out, we were politely looked upon as adventurous and a little unrealistic and that now people say we were ahead of our time. And finally, why did you call it Apollo?